Looking back, it was Mitch’s first job that set him on his lifelong path of working with food. At age 15, he started working in a retirement home – washing dishes in the kitchen. From there, he got other part-time jobs, including dabbling in landscaping for a while, but he always returned to working with food. When he started college at the University of Iowa, he worked part-time at a fine dining restaurant in the student union. Here he got what he calls his formal training, where he worked with a chef who was classically trained. The restaurant changed the menu every month, providing Mitchwith the opportunity to learn a wide variety of techniques and to work with many types of ingredients. Although Mitch graduated from college with a degree in English, he soon realized he preferred working in restaurants. Since that time, he’s worked in a wide variety of food-related professions, from catering to managing a bar and grill to hearth bread baking. It was working for Biaggi’s that brought Mitch to North Carolina. He came to Cary to open the Biaggi’s here in 2001. He continued there until 2011, when he got the opportunity to work at the Chef’s Academy. 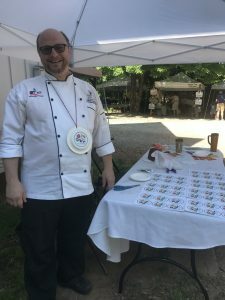 It was an ah-ha moment for Mitch when he made the switch from restaurant work to teaching others how to cook and work in the restaurant industry. This gave him the opportunity to both work with food and have time to spend with his family. Mitch enjoys talking to people and hearing their stories, hearing what they’re doing. He loves lots of questions because they helps him learn how to help folks take an ingredient or cooking method that at first seems distant and make it accessible and doable. Stop by Chef Mitch’s table this Saturday to taste the dishes he’s created using this weekend’s produce, and ask him a question, or two, or three. He’ll love talking to you.